“In such a time of hopelessness, we had no idea what to do ahead. We had no money saved to spend for the house construction. The immediate help of government was not adequate to meet the need of new construction.” At this time our partners stepped in with 5 bundles of zinc sheets. This turned things around for them. 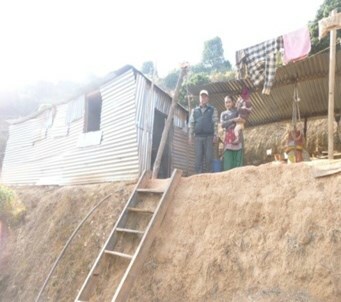 “Right after receiving zinc sheets , we built up a shelter and moved right in. Then, we started cooking inside the shelter itself.” How amazing that we were able to help this little family, now with an 18 month old little boy, begin the process of rebuilding their lives. This shelter is semi-permanent and Santos aims to reconstruct his house again with bricks and stone. He told our partners that his desire is to build a house where he can live, store crops and keep livestock. Thank you again to all those who donated during the Nepal appeal, your generosity continues to impact the daily lives of these grateful people and their little boy.